I know I say it a lot but my daughter (Sweet) was the inspiration behind this pretty little party. Her favorite color is rainbow......which suits her personality perfectly. It's quite a simple party as it was for Easter and there would be lots of chocolate eggs soon to follow. I made a pretty pastel rainbow ruffle cake (CLICK HERE FOR HOW TO MAKE IT) as the center piece of the party. 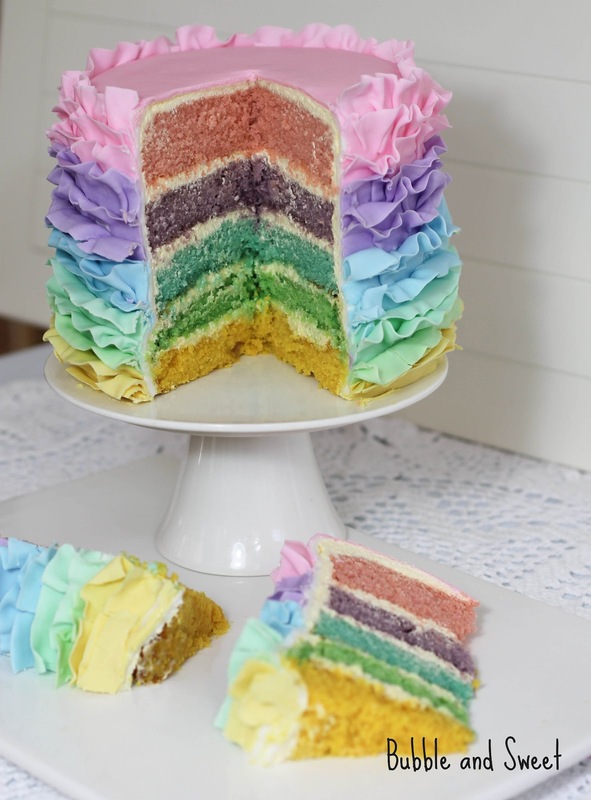 It is actually also 5 layers of rainbow cake inside to match the outside ruffles and adorably pretty. 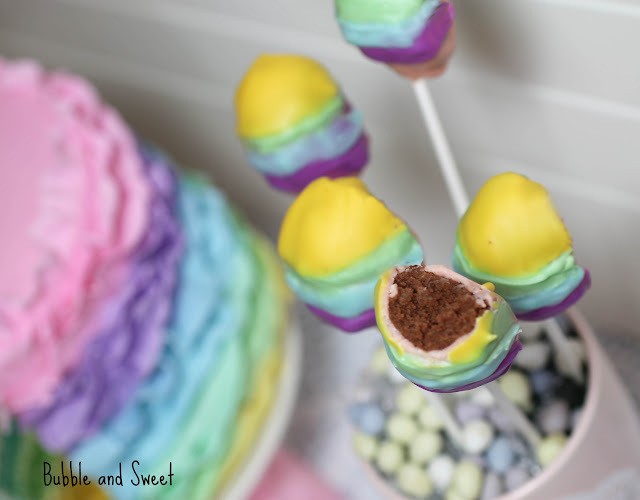 Then I made up some Oreo Eggs (CLICK HERE FOR OREO TRUFFLE RECIPE) and dipped them in a rainbow of candy melt colors. 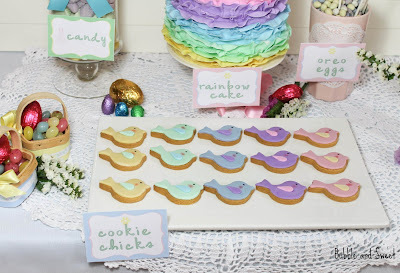 I also made up some simple chick cookies in rainbow colors. The cookies are all about the cute cutter which I picked up at Ecrandal. I found a pretty Easter printable range at The TomKat Studio which was in soft pastel colors that worked in well. 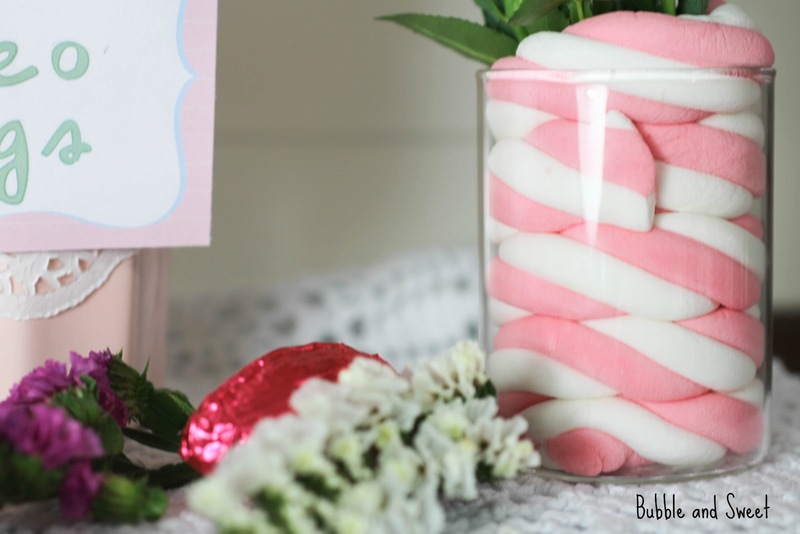 The Candy are actually Yogurt Gummy type lolli's. I know it sounds totally weird but they actually taste nice. 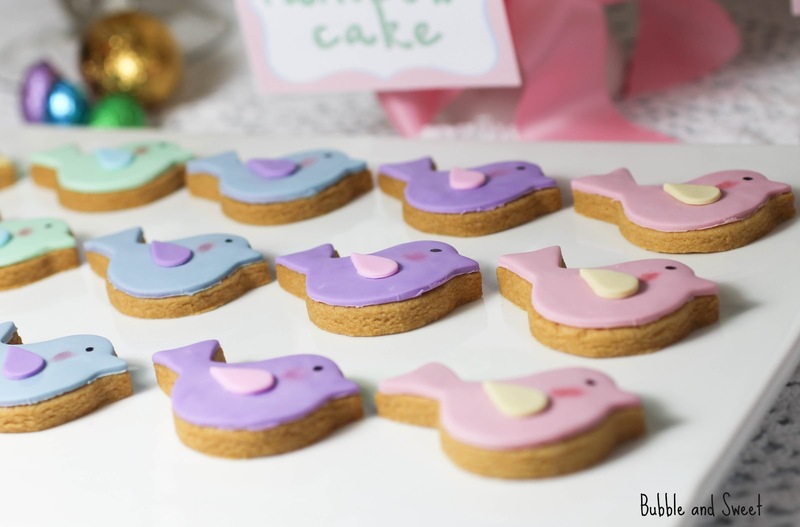 They are 99% fat free, 50% fruit juice with yogurt powder and milk solids - Oh my goodness it's nearly like a health food (saying that mockingly). 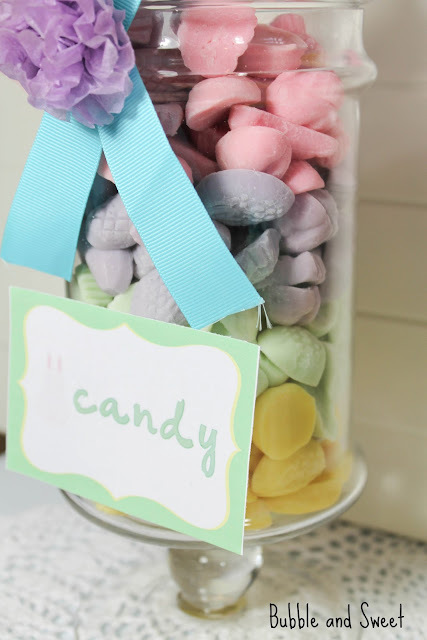 But I was really pleased I found them as they are a super pretty pastel color and they were so reasonably priced. They came in a huge packet which also had orange and white and I just popped on some gloves and separated them. They are made by vitabite and also come in frog and snake versions. In the US I found some on a site called Yogurt Gums that looked the same. 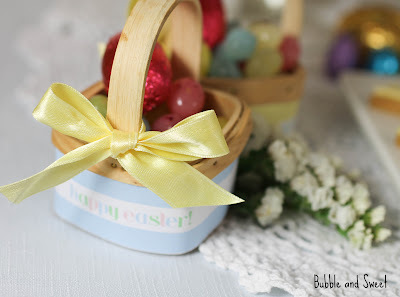 I filled pretty mini baskets I picked up last year from Sharnel Dollar Designs with jelly bean eggs and chocolate eggs and decorated the baskets with The TomKat Studio printables and a ribbon as thank you gifts. 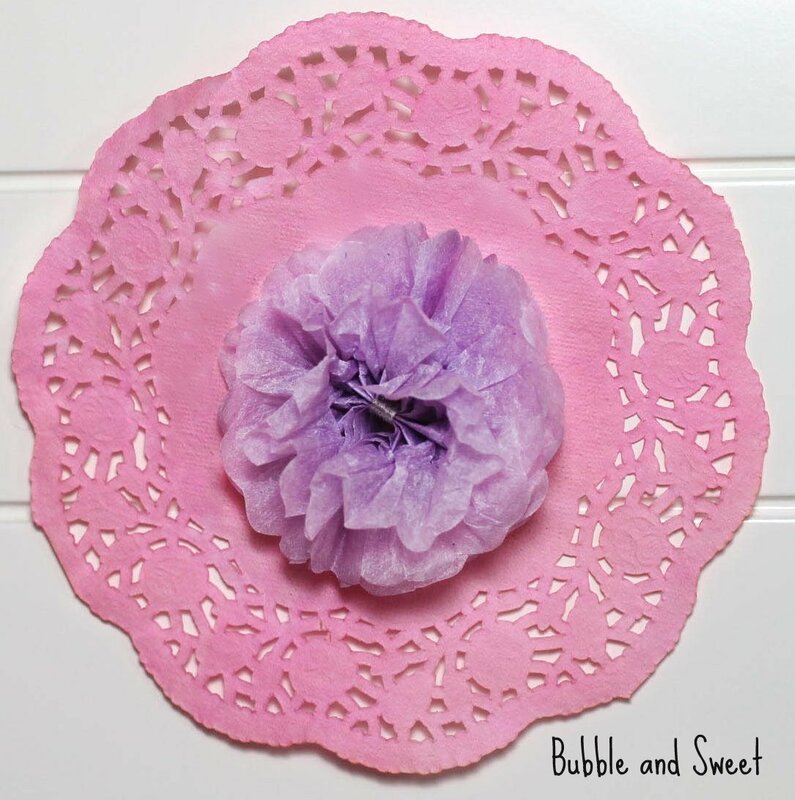 and I popped some on hand made card rosettes and some on hand dyed pink paper doilies. 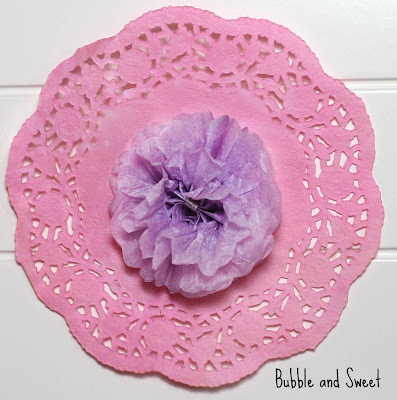 To hand dye doilies pop on some gloves, mix up some food color in water in a shallow bowl. Hold on to the edge of the doily on the right side, dip the left half and then hold on the other side and dip the right side. Place on Viva or paper towels until dry and then iron inbetween a couple of paper towels. 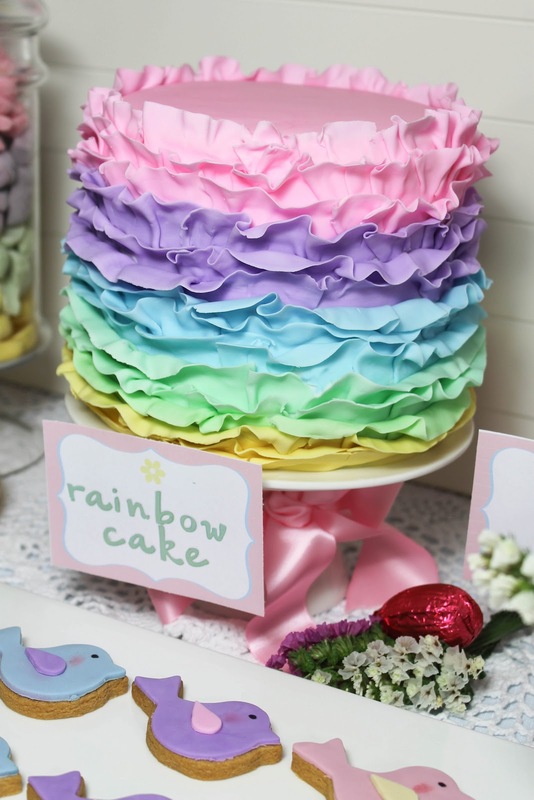 I just LOVE pastels, and I love your ruffle cake! 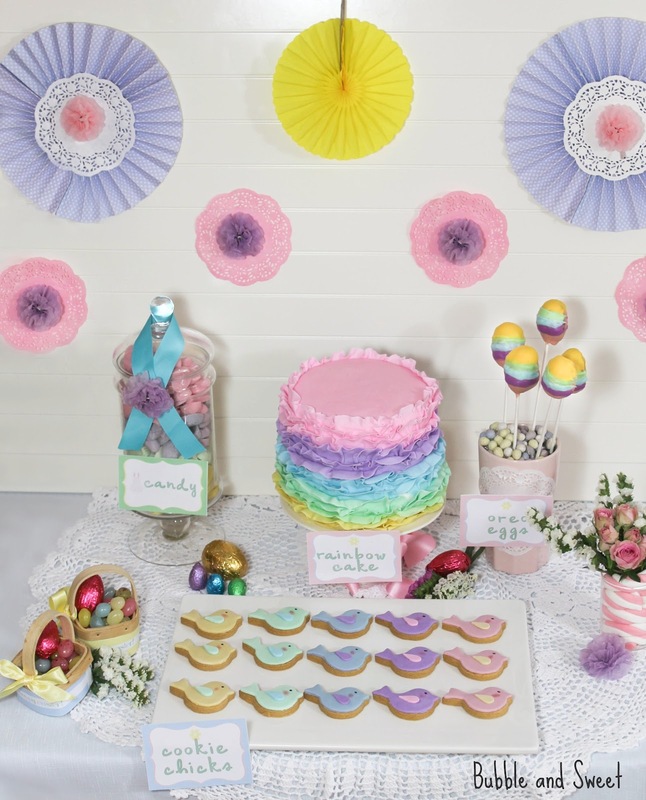 What a lovely little party! Really adorable! Love the colorscheme! 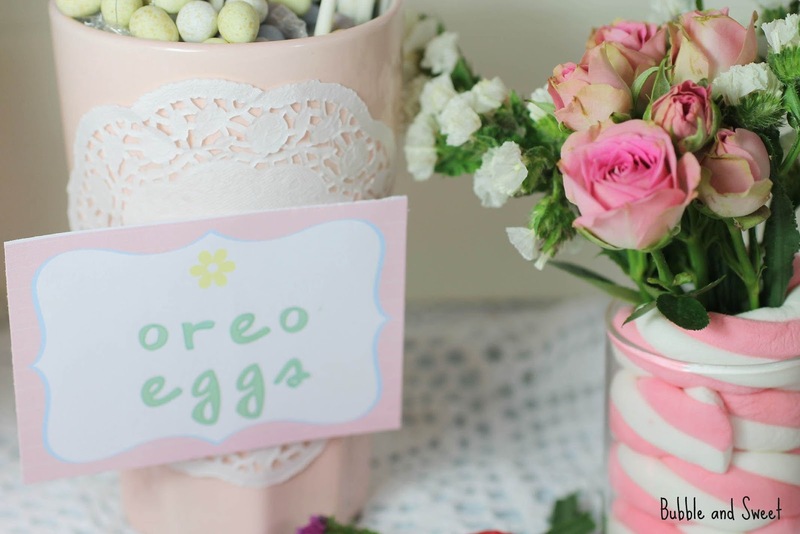 So much Easter prettiness out now! this is something out of a magical fairy book...so pretty! 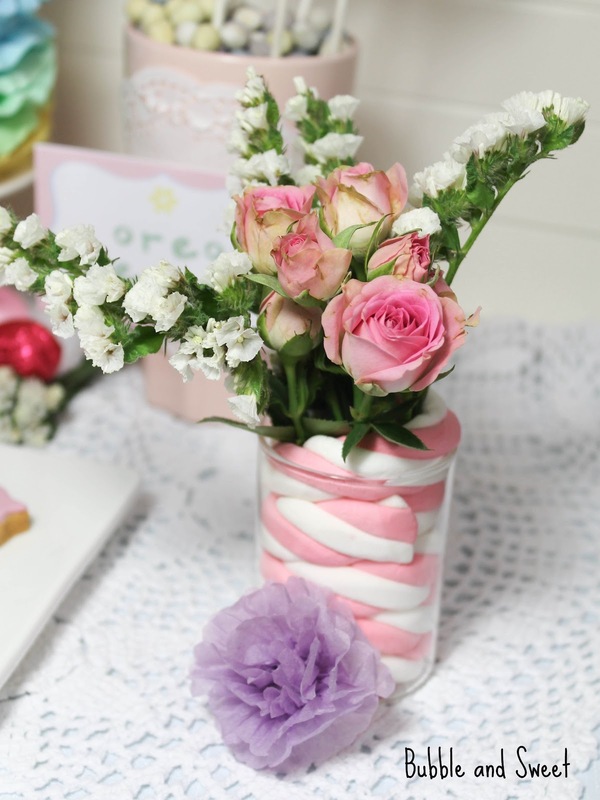 The frills on the cake are so simple and so beautiful!